The most important thing we do at Christ Memorial Presbyterian Church is worship—the One, Triune, Holy God. 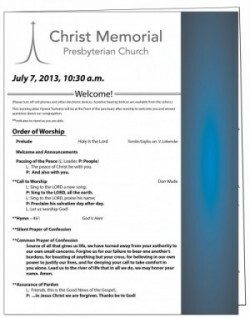 To guide us in our worship each week we distribute a worship bulletin that includes the order of worship as well as important information about what is going on in the life of the church. Here you will find an archive of past worship bulletins for your perusal. To download some of our recent worship bulletins, please click the links below. Sermon recordings are available here. Saturday, December 24, 2016, 8:30 p.m.
Saturday, December 24, 2016, 5:00 p.m.